In spite of the fact that I’m right smack in the middle of my foyer makeover, my mind is already looking forward to the next project, which I’ve decided is going to be a guest bedroom. My foyer is well on its way to completion and as soon as I finish a couple of more projects, it will be done and I need to be ready to move on to the next project! I’ve been mulling things over and looking for inspiration for my guest room for quite a while, but was getting frustrated when I couldn’t quickly figure out what to do in this room. It seemed that every idea I came up with wound up being rejected for one reason or another. These definitely are not beauty shots, but here’s how the room looks today. We’re fortunate that it’s a spacious room and includes a bump out for a bay window. Recognize those chairs? Those are the ones that I’ve mentioned several times about buying them because they were a good deal, but were ultimately a waste of money. On the other side of the bed, there’s a large, blank wall for me to contend with. Isn’t the ceiling fan lovely in all its shiny brass and cut glass glory? I’m planning to give the original dining room chandelier a makeover and use it in this room. The dresser is at the foot of the bed and has been sitting without a mirror ever since we moved in over two years ago. I’m planning to keep my existing furniture, but give it a facelift with paint. I am going to replace the teal chairs though. Some things are still fluid, such as the bedding and that big wall. I won’t know exactly what I’m going to use for bedding until I see it, but this mood board should give you an idea of the overall look that I’m going to work toward. Love the idea of using a mood board for your own home decorating? Learn how easy it is to create one by clicking HERE! Love your vision. Maybe some colorful pillows to balance all that gray? I know this will turn out beautiful! 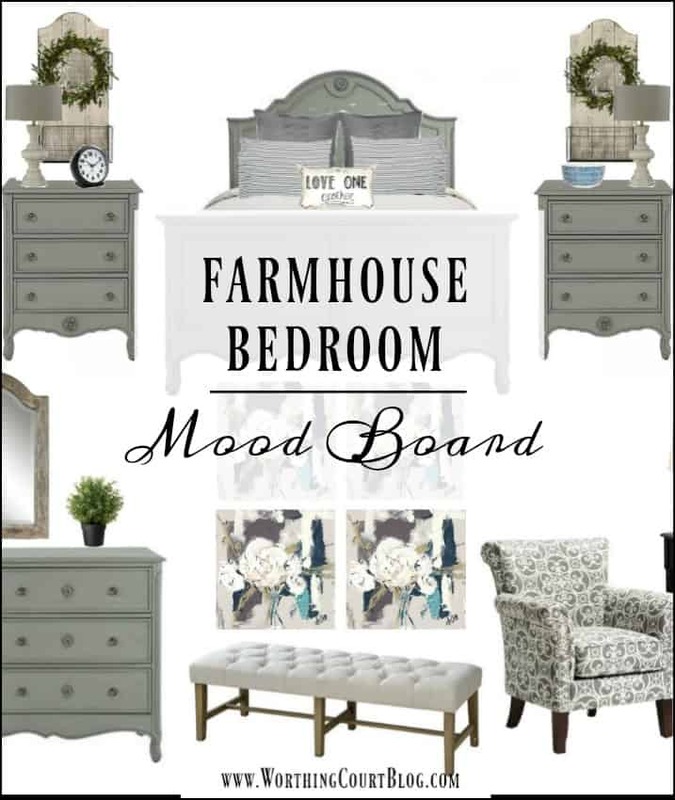 Love your mood board — the room is going to be fabulous. I can’t wait to see the transformation. Painting the furniture will make a huge impact and definitely put you on the road to the farmhouse flair you want in this room. Hahaha….she’s just checking to see if you’re looking at the blog. I’m sure you won’t have to help with a thing….well maybe move some furniture. 60/40 ? I am sure it will be a calming and pleasant room. What a beautiful space with the bump-out windows! Love the wall hangings in your mood board with the wire baskets! Looking forward to seeing the finished room. Painting the furniture will totally transform them; I can totally picture then that lovely color! And I love the symmetry you’ve chosen with your accessories. I think it will look great! I will be trying to put together a “mood board” for our master bedroom, tho” I don’t have all that lovely space that you do! I have that same exact bed!!!!! Can’t wait to see it painted! I love your furniture, glad you’re keeping it. I don’t know how to do a mood board on the computer, so I’m just impressed that you did it! Haha! Those are the same blue chairs from the office aren’t they? Still haven’t found their forever home? Just noticed Pookie’s comment! Too funny! Pookie is definitely reading your blog! Now he knows what’s next on the honey- do list. You’ve got me hooked. I have to come back and see what you do with this bedroom! Can’t wait to see the final product! Love your ideas. I can not wait to see your guest room completed. I know it is going to be wonderful!! I love that your husband reads your posts. Have a great day. I like the furniture you have painted in your other rooms, so I can’t wait to see the bedroom furniture after it is painted. It will be a dramatic change, I’m sure. I love your mood board! I can’t wait to see your furniture painted. Really enjoyed your mood board! Can’t wait to see were you go. This room is going to be beautiful. I’ve never done a mood board either. Did you use a certain resource? PS: Pookie’s comment is hilarious! Hi Jen. Yes, I used PicMonkey to create the moodboard. I’ve had so many people ask about that I’ll probably do a tutorial in a couple of weeks. It’s easy and free! 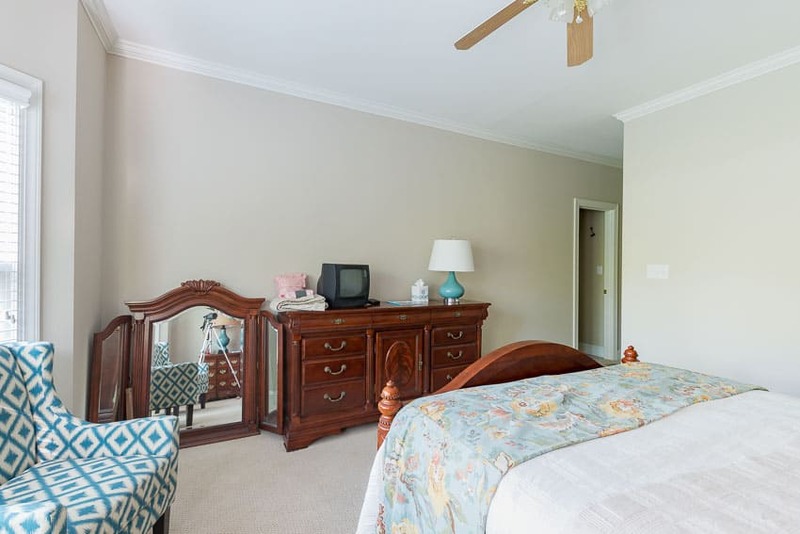 It looks like it will be awesome – I would love to paint our antique mahogany bedroom suite, but hubby is concerned it will decrease it’s value – but it’s so old and not in great shape. What are your thoughts? Hi Heather. I’ve often heard that if you own a true antique, you will diminish its value by painting or refinishing it. I’ve had really old furniture that I didn’t like and didn’t paint for the same reason that your husband is concerned about. But…then I realized that just because something is old doesn’t make it a valuable antique. If you’re concerned, I recommend getting someone to come take a look at it or if you’ll Google “what is my antique bedroom set worth”, you’ll get lots of results that you can check out. I love the gray! You have made it so inviting and calming! Thank you for your tenacity with your projects! It is inspiring! Sounds fun! I love re-doing rooms! Love the mood board idea! I’m going to use a “duck egg blue” bed that has dark brown distressed areas that relate to the mahogany chests on each side that I can’t bear to part with. I understand your dilemma Heather Anne because I have plenty of valuable mahogany furniture that nobody wants anymore. So—maybe it’s not all that valuable? I have a lot of cherry furniture in my house because I love the traditional look and am afraid if I paint it I might regret it down the road. Always anxious to see what others are doing to update the look of their traditional pieces. And like others have mentioned, how do you create a mood board online? Love it! Hi Sharon. I created the moodboard on PicMonkey. I’ve had so many people ask about how to create one that I’ll try to put together a tutorial in a couple of weeks. Best of luck! I will probably be borrowing ideas for my own update! Painting the furniture will make such a difference. Your husband has a great sense of humor! Guess his “mood” is a huge help in getting your ideas from ideas into reality!! Can’t wait to see your creation come together! The mood board looks great — but I’m really interested in how I can create my own mood board. Is there an app? How do you get the photos of items without the background? Looking forward to the final “product.” Your mood board has given me great inspiration. I too am ready to do a BR makeover. The only decision that I have made is the choice of wall color paint – and that has taken me a few weeks. I hope creating my own mood board will make the process less painful. I always look forward to your house design plans.. I love the idea of a mood board also. Can you tell me what computer program you use to place the furniture around with. I have been looking for one to visually set up a floor plan with furniture to scale in the picture. Hi Pat. I used PicMonkey to create my moodboard. Lots of people have asked, so I’ll probably be doing a tutorial in a couple of weeks. I like the your teal chairs, too! Maybe if you paint the legs a similar color to the rest of the furniture, they could stay? Some neutral pillows on them? Just some thoughts (that you have probably already had! 😉 ) Missing you today… hope all well. Looking forward to this creation to unfold! Lovely! I need to do a mood board. 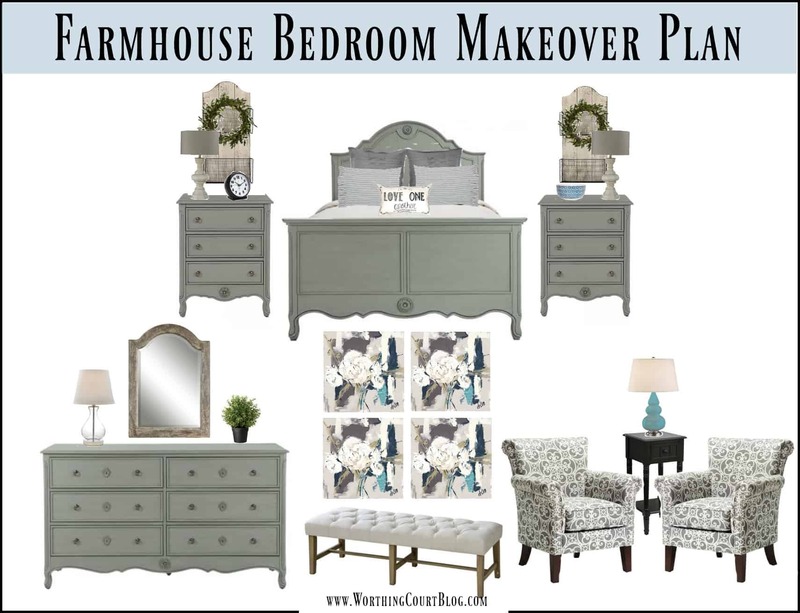 I am contemplating a master bedroom makeover this year… Great info. Thanks for sharing at Dishing It & Digging It! I have been struggling with our guest room for a year. I think that I will try a mood board. I can’t wait to see how yours turns out! Hello! I , too love your mood board and your ideas for updating your guest room. I look at my bedroom furniture and say to myself….time to make a change…I have been thinking of grey, as well….Looking forward to your changes and future posts…could you just have slipcovers made for those chairs? Thanks for all your outstanding ideas!! Slipcovers are actually an idea that I considered, Diane. 😀 But, those chairs just don’t warrant the expense of custom slipcovers and it isn’t a project that I want to tackle myself. I think that I’m going to be able to use them in a guest room that we have upstairs. I am ready to redo our master bedroom I will be looking forward to your tutorial on mood boards. I think it will be a great help. Love your ideas. Your room is going to be beautiful. Can’t wait to see it finished. I love your mood board. I imagine it is easy to add new pieces to or take off pieces till you have it just right. How long does it usually take to put a mood board together that your satisfied with? As far as painting furniture goes I see another can of two of Rustoleum Anodized Bronze in your future:)! Hi Debra. Creating a mood board is pretty easy and doesn’t take that long. The most time consuming part for me is settling on products (or similar products) that I want to use. Once I have those, the mood board itself comes together pretty quickly. Love the things you have on the mood board and can’t wait to see how things come together for you. The room is very spacious and I’m sure it will be fabulous! Some teal pillows would look great with the floral material. I like the mood board idea! I love the bedding! I can’t wait to see it finished. I love the farm house look. I’ve never done a mood board for my house but I would if I was starting from scratch! The only thing left in my dining room makeover is to decide what I want to do with the oak trash can holder. I had originally planned to chalk paint it but I decided to “go big” and re-did my hutch instead! Now that the table has chalk painted legs and chairs and a stained and glazed top I’m thinking I’ll refinish it with General Finishes Java gel. Thanks for inspiring me! I really love those chairs! Why don’t you just have slip covers made for them? I actually thought about doing that, Peggy. But – I just don’t think these chairs are worth the expense of slipcovers. They’d probably cost more than the chairs did. lol I’m really hoping that I’ll be able to reuse these chairs in my second guest room. I love your bedroom mood board as much as I lover your office makeover. Love the ideas on the board. Can’t wait to see it completed! 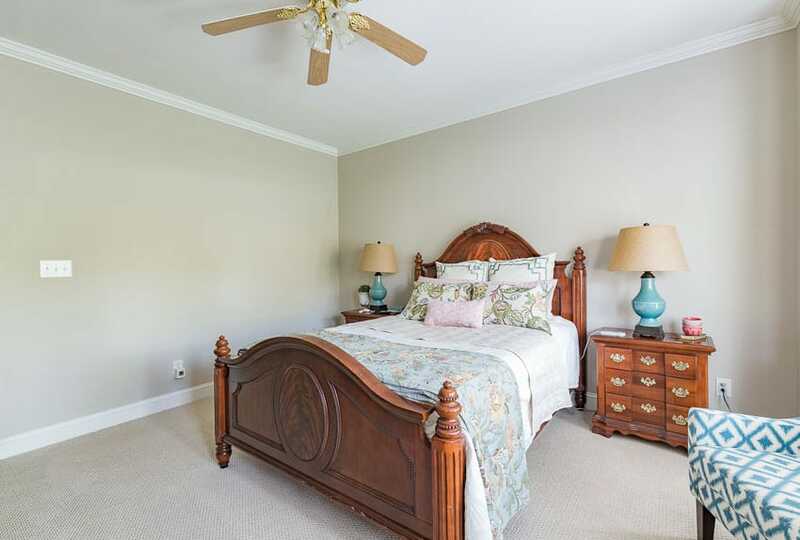 The bedroom has good bones and lots of potential. From your photos it appears that the bedroom is having an identity crisis. The bed, end tables, dresser and mirror all say, “traditional” but your soft furnishing (bedding, 2 chairs) all say “beach/Florida” while your mood board says “farmhouse”. Based on what you did with your dining room furniture and looking at your mood board, paint your furniture a soft grey and put a colorful area rug on top of the existing rug. 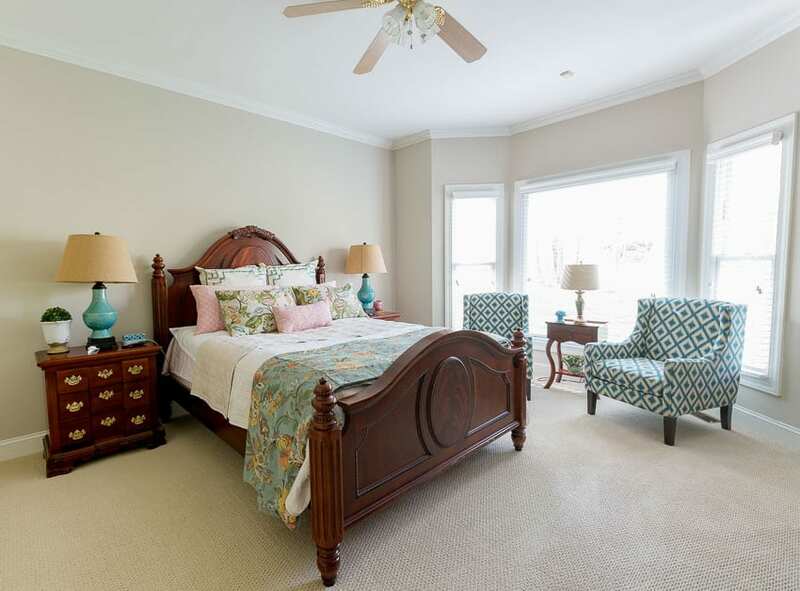 The rug should not be wall to wall but act as an accent with part of the bed resting on part of the area rug. The 2 chairs are fine. If you are inclined to paint your walls, what about a “wash” of blue. Your windows look naked and need some sort of definition. What about some type textured curtain panels (i.e.batiste, gauze) or replace the current blinds with wooden blinds for added texture (a soft driftwood color would tie in with the ideas reflected on your mood board)? Love your ideas, and I can’t wait to see the end results! Your bed side tables remind me of card catalogs, which I love, I bet you could paint them and change out the hardware to resemble card catalogs !